To make their dream home a reality for retirement, Nancy Richard and her husband, George, took great care to get every aspect of the home building process just right. But they didn’t have to do it alone. They found the right construction loan with the help of familiar faces at their local Hancock Whitney financial center in Youngsville, Louisiana. As a longtime client of the bank, Nancy was at her local financial center for an everyday transaction when the conversation turned to her dream of building a home “out in the country,” as she puts it. What Hancock Whitney offered was a breath of fresh air compared to the loans from the other banks Nancy and George had been researching. “We had the feeling that the people at Hancock Whitney had known us for a very long time, and that was important to us,” says Nancy. 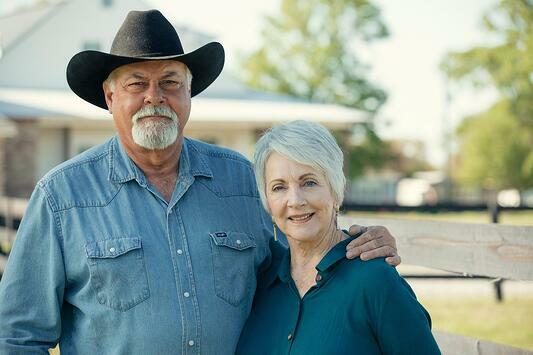 With their construction loan from Hancock Whitney, Nancy and George built their dream home exactly as they imagined: a four-bedroom modern farmhouse on 40 acres of land in Abbeville, Louisiana. While it’s 30 minutes away from the financial center they frequented in Youngsville, she wouldn’t think of changing banks. “They treat us better than family…and there’s something very special about banking where people know who you are,” she says. Today, the Richards are happily living in their dream home, which their children and grandchildren love visiting. With high ceilings, an open floor plan, a balcony, a screen porch and outdoor kitchen, it’s perfect for entertaining. “Build it, and they will come” is what George used to say to Nancy about the house. And it’s been true. In addition to the children and grandchildren, friends and friends of friends love to spend time at the house and on the land.